After 15 years of deflationary policies the Bank of Japan now clearly is changing course. That should be clear to everybody after today’s policy announcement from the Bank of Japan. I don’t have a lot of writing here other than I will say this is extremely good news. Good for Japan and good for the global economy and what the BoJ is doing is nearly textbook style monetary easing. The only minus is that the BOJ is targeting inflation and not the NGDP level, but anyway I am pretty convinced this will work and work soon. Under this guideline, the monetary base — whose amount outstanding was 138 trillion yen at end-2012 — is expected to reach 200 trillion yen at end-2013 and 270 trillion yen at end-2014. The monthly flow of JGB (Japanese Government Bonds) purchases is expected to become 7+ trillion yen on a gross basis. The Bank will achieve the price stability target of 2 percent in terms of the year-on-year rate of change in the consumer price index (CPI) at the earliest possible time, with a time horizon of about two years. In order to do so, it will enter a new phase of monetary easing both in terms of quantity and quality. It will double the monetary base and the amounts outstanding of Japanese government bonds (JGBs) as well as exchange-traded funds (ETFs) in two years, and more than double the average remaining maturity of JGB purchases. After 15 years the BoJ is finally listening to Friedman’s advice and I am sure it will do a lot to revive the Japanese economy. In fact the BoJ is doing more than listening to Milton Friedman. The BoJ is also listening to the Market Monetarist message of using the Chuck Norris Effect by guiding market expectations. Good work Kuroda. And finally a message to ECB boss Mario Draghi. If you want to end the euro crisis just copy-paste today’s BoJ statement. You have the same inflation target anyway. It is not really that hard to do. I thought of the same article by M. Friedman yesterday, lets hope they will at least lend a hand to ECB if it doesnt learn anything after all. I’m surprised that you like that Friedman quote, since he seems to believe that monetary policy works by banks lending out “high powered money” (with the implication that if expanding the base has no effect, it’s because of “zombie banks” not making loans). 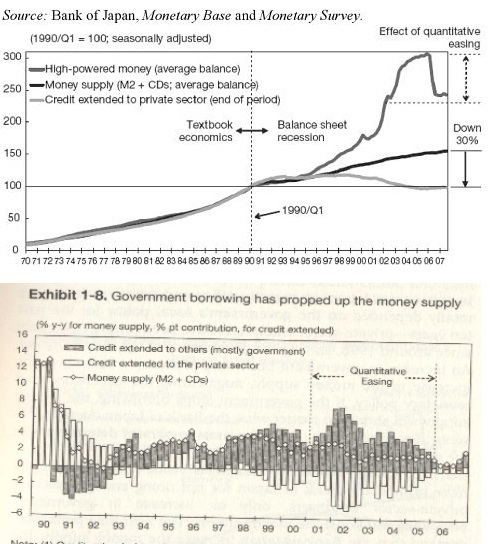 Friedman clearly was aware of the difference between the money base and broader money supply measures. In terms of “zombie banks” I think it is mostly an excuse for not using monetary policy. The problem is not a credit problem, but rather a money problem. In my view there is an excessive focus of banking problems. Banking problems mostly are a result of overly tight monetary policy – rather tight money being a result of banking problems. Lars, one thing I don’t understand is why Japanese bond yields are *falling*. The yen is weakening the NEKKEI is up over 2% (typical Market Monetarist response) but yields are falling. Is this M0 expansion so big as to cause the liquidity effect to dominate the income effect? Seems doubtful given that the Japanese bond market is so huge, but then I don’t know much about Japan. That could seem puzzling, but try have a look at the statement. The BoJ basically is signaling that they are buying bonds across the entire yield curve. I think that is what is pushing down yields today. That I would not expect yields to stay low. But the signal from the market is completely clear. This is significant monetary easing. And note this is much more powerful than what the fed is doing. It is nearly the same amount of QE – in dollar terms – but for a somewhat smaller economy. Lars and other European observers – do you get any sense that there some an opposition movement in European crisis-hit countries to the ECB’s monetary policy? I hear a lot about a rejection of the Eurozone’s austerity policies, but relatively little about the monetary aspect (other than Berlusconi, I think). And then you have the Polands and Swedens of the world who have their own currency but seem afraid to use monetary policy. So basically – what the heck is going on? With respect to Japanese bond yields dropping: is the publicity some how increasing the demand for bonds, therefore pushing up their prices (maybe a short term effect)? Totally agree!! It’s just painful to watch Germany opposing any measure in the direction of monetary easing…Their unfounded paranoia about inflation is plunging the Eurozone in recession. I can’t understand how is it possible that they don’t understand (probably they pretend not to) that the danger here is deflation, not inflation! I wonder if you have read the history books and potentially even Richard Koo’s Holy Grail, that clearly show that Japan applied quantitative easing between 2001 and 2005 according to Friedman’s advice. But it did not have any effect, despite the rising monetary base, credit supply did not improve. Yes, I am aware of Koo’s view – and he is aware of my views. We discussed last year at a conference in Vilnius. The problem with the QE done in that period however was that the BoJ never clear stated what it wanted to achieve. There’s probably the difference. Koo thinks that fiscal spending successfully replaced consumer spending, preventing an economic collapse. Consumers did not spend and firms did not invest due to the long-lasting effects of this extreme bubble, far bigger than the US subprime boom. The big difference between 2001-2005 and now is for me that QE might work now because time (and not QE) has healed the Japanese wounds. Moreover there is no incentive for Japanese to invest abroad, in particular in the US or (Southern) Europe, given that those just follow Japan into a lost decade.